Travis was gone yesterday and today on a work trip. The perfect time to get his Valentine’s Day present ready–a giant chocolate chip cookie heart with chocolate frosting and red hots. 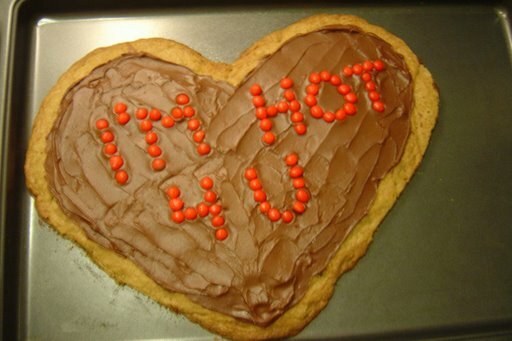 (See my Valentine’s Day Cookie). If the cookie looks good to you, you’re right–it is good. Since I gave up chocolate for Lent, it was a test of willpower to bake this scrumptious cookie. This was actually my second attempt. The first one, I shaped exactly how I wanted it before I put it in the oven–so it came out looking like a circle pretty much. The second time around, though, I got smart and made the shape very exaggerated. And it came out good! Anyway, back to the first attempt. It was all gooey in the middle and fell into about 12 different pieces as I tried to scrape it off the pan. And then I had all this chocolatey gooey goodness sitting there on the counter staring me in the face. It was screaming “Eat me! Eat me!” I even felt my fingers twitch. But I didn’t do it! I didn’t eat chocolate! I am so proud of my willpower (because usually I don’t have much when it comes to baking). I am, however, going to freeze the chocolatey gooey goodness until after Easter. Then I am chowin’ down!